As the summer arrives, many people worry about watering their lawns consistently and maintain the lush green surrounding. If you intend to water your lawn manually, it can be a tiring and annoying task as you need to do it on daily basis. Installing a sprinkler water system is the most effective solution to overcome this issue and let you enjoy a greenish, healthy looking lawn and yard. Installing a water sprinkler system in your lawn is associated with several benefits as mentioned below. The most feasible benefit of installing a water sprinkler system in your yard is a perfectly automated water supply. Once such system is installed in your lawn, you will never want to worry about manually supplying water. However, time to time, you may need to pay attention to the maintenance of the system (which is way easier than everyday watering). When you have a sprinkler irrigation system in your garden, you can expect a precise water distribution throughout every square inch of your lawn. Also, you can time limit the water supply ensuring no excessive or moderate water supply but the right amount of water within a specified duration. Water sprinkler systems dramatically help to save water. In fact, since these water systems enable you to water the lawns even during the night, you can expect grass and plants to make the best use of coolest temperatures and absorb more water. Further, by any chance, if you face a draught or specific water conservation period, you can adjust the amount of water sprinkled and save a considerable amount of water. To make the best use of these water sprinklers, you should smartly adjust the system to distribute the correct amount of water. Depending on the climate, you can adjust the water levels and refrain from wasting water. 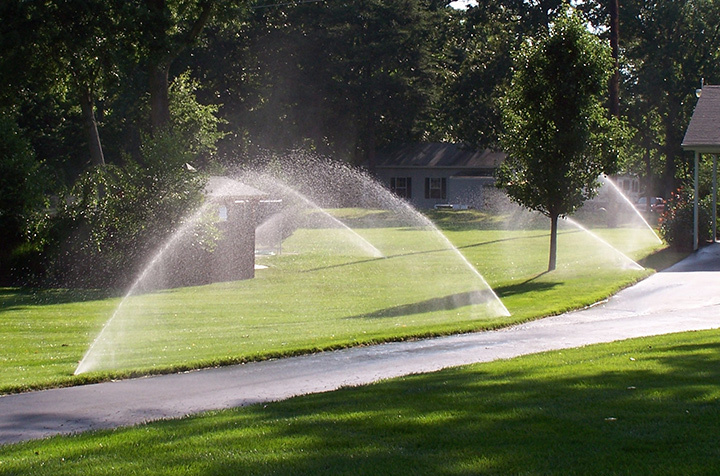 With water sprinkler systems, you can customize the strategy of water distribution to perfectly match the size of the lawn, shape and the type. You may select the best matching strategy from varieties like oscillating, stationary, revolving, and traveling sprinklers. Other than using for the purpose of watering the lawn, you can use sprinklers to water other aspects of the garden like flowers, plants, hedges and even different types of trees. This is a great way to save your time in this busy society. The lawns and the yards that are equipped with sprinklers are signs of proper garden care. Such garden automatically adds value to your property considering the efforts you have taken to maintain a healthy, fresh garden. If you need to install a supreme quality sprinkler system in your garden and enjoy all the benefits mentioned above, contact Gonzalez Land now. We use the finest quality products and expertise manpower to provide you the best sprinkler systems in the industry. Call us today to get information about our affordable sprinkler system installations.